Product information "L3MBTL1 MBT domains (human recombinant, GST-tagged)"
Key Features Cayman's L3MBTL1 MBT Domains TR-FRET Assay Kit (Cay-601030) was developed using L3MBTL1 MBT domains (human recombinant, GST-tagged) protein.Bulk sizes available upon request "The malignant brain tumor (MBT) domain is structurally related to chromatin binding domains, such as chromodomains, tudor domains, and PWWP-domains. MBT domain-containing proteins have a variable number of MBT repeats. The MBT domains recognize methylated lysines on histone tails with varying degree of specificity for the various methyl marks. L3MBTL1, a human homolog of the Drosophila lethal(3)MBT protein, is a member of the polycomb group (PcG) of proteins that functions as a transcriptional repressor. L3MBTL1 contains three MBT repeat domains which collectively bind to either histone H3 or H4. The second and third MBT domains were found to bind preferentially to mono- and dimethylated lysines of histone H3 at lysine 4 (H3K4me1) and histone H4 at lysine 20 (H4K20me2). Recognition of methyl-lysine marks by MBT domains leads to chromatin compaction and a repressed transcriptional state. Further, L3MBTL1 has a tumor suppressor function and is thought to play a role in maintaining genomic stability and DNA replication. This protein product contains the MBT repeat region of L3MBTL1." 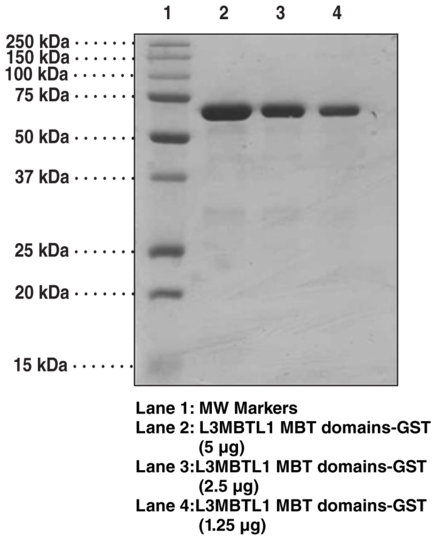 Customer review for "L3MBTL1 MBT domains (human recombinant, GST-tagged)"